Mingalabar and welcome to Myanmar! Upon arrival, transfer to the domestic airport for the flight towards Heho. Upon arrival at the Heho airport your biking team will be waiting to greet you. Take a short drive away from the airport to a quiet street where we will enjoy a light picnic lunch then test out our bikes. After a safety briefing, we start pedaling to Pindaya, a scenic ride that provides a great introduction to the Shan State. Ride over rolling hills dotted with fields growing cabbages, chilis and other produce. Stop to chat to farmers in the field, many of whom will be wearing tribal dress from the Danu or Pa-Oh ethnic groups. Cross through local villages then enjoy a gentle downhill ride into Pindaya. Check in to the hotel and relax before heading out to dinner at a local restaurant. Lunch and dinner included. Overnight in Pindaya. We start the morning with a visit to the Buddha-filled Shwe Oo Min Caves. Arriving before the tour buses, we can enjoy the tranquility while exploring the thousands of Buddha images and hidden cave chambers. Then it’s back on the bikes for a door-to-door ride to Kalaw. As with yesterday, we pass by colourful fields and hilltribe villages. We also cross through pine forests and enjoy breath-taking viewpoints along the way. The last stretch of the ride puts us on a main road for a short distance before descending to Kalaw. After a shower, we will take a short walk around the town’s colonial-era buildings for a glimpse into its past life as a British Hill Station. Breakfast, Lunch and dinner included. Overnight in Kalaw. We take another door-to-door ride today. After a short double-back on the main road, we venture off on the road less traveled, passing villages inhabited by ethnic hill tribes and enjoying fabulous scenery. A whizzing downhill descent takes us to the flatlands near Inle Lake’s edge. We then ride up the western shore, a road with little traffic and gently rolling hills. We’ll stop in a small village for a short walk to see scenes of authentic local life. 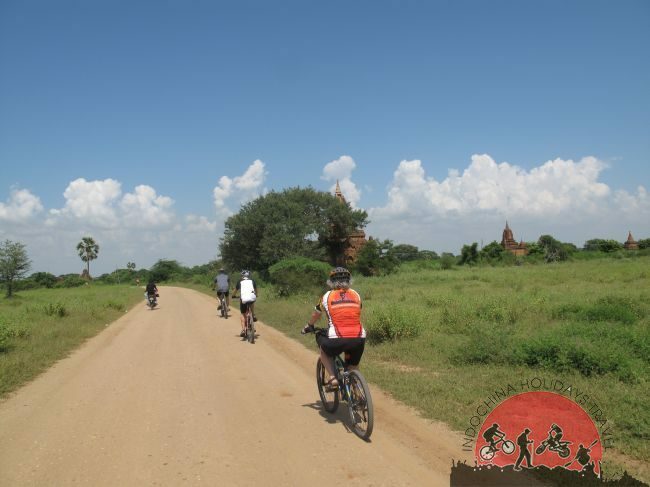 Then we pedal into the town of Nyaung Shwe, the gateway town for Inle Lake. Breakfast, Lunch and dinner included. Overnight in Nyaung Shwe. 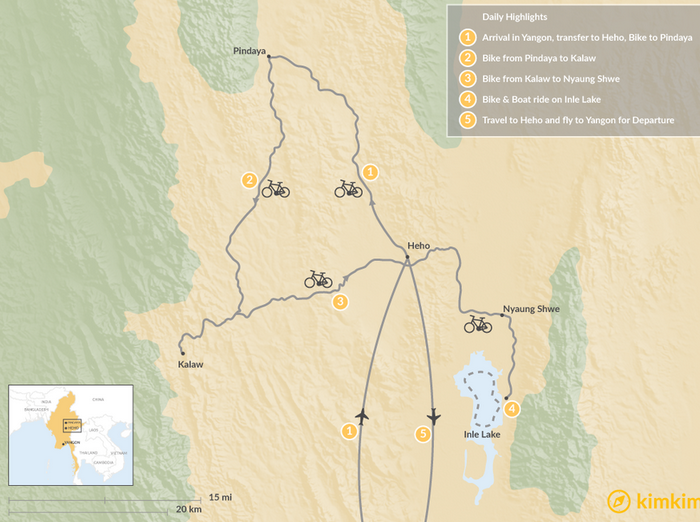 We start the day with a bike ride along Inle’s eastern shores. This short ride gives great insight into the lives of the lake’s residents, who rely on the lake’s fertile soil for their livelihood. We then board a motorboat to explore the famed floating gardens, traditional handicrafts and Pagodas of the lake. We’ll return to town late this afternoon, saying farewell to the cycling guide and enjoying a night at leisure. Breakfast & Lunch included. Dinner on own account. Overnight in Nyaung Shwe. Your Myanmar adventure concludes today with a flight to Yangon. A drive will pick you up in time for a transfer to the international airport for your onward flight.